Enjoy a beautiful view with a seamless display surface* and 16:9 aspect ratio. Stay connected* with advanced wireless options. Navigate like a pro with optional built-in GPS*. 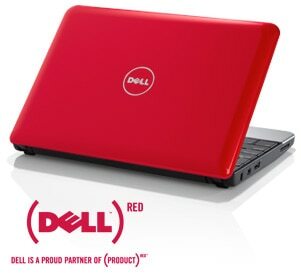 The InspironTM Mini 10 and Mini 10v are everything you want in a mobile companion and much more. Their highly portable, sharp design is complete with excellent wireless and entertainment features, making the Mini 10 and Mini 10v exactly what you’re looking for in a best friend. 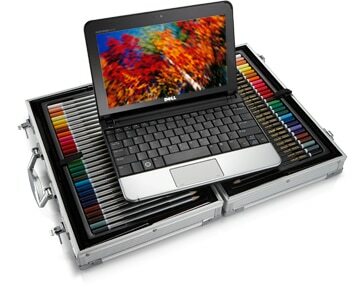 And with 7 color options, you can customize your companion at a price that is more than satisfying. 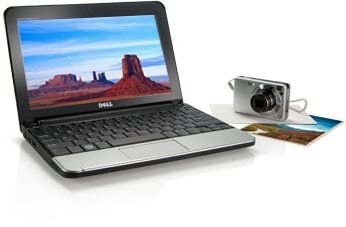 The Inspiron Mini 10 and Mini 10v are designed to give you access to your favorite entertainment. When you are on the go, you can still be connected to email*, shopping and more. A bright 10.1", seamless* widescreen display surface with a 16:9 aspect ratio is designed to present websites without lots of left-right scrolling, as well as with a smoother line of sight. Expand your screen by connecting to an external monitor or TV using the HDMI port*. Plus, you can now watch your DVDs on the optional external DVD drive. The Inspiron Mini 10 and Mini 10v make it even easier to stay connected* to your world wherever you go. The new internal 802.11b/g WiFi connection brings you wireless technology as well as optional Bluetooth® 2.1. And the Inspiron Mini 10 and Mini 10v’s small, virtually weightless design lets you travel light while keeping up with your blog, video chat, instant messenger and email so that you never lose touch with your family and friends. Personalize your Mini 10 or Mini 10v with a choice of 7 eye-catching colors. Choose from Obsidian Black, Pearl White, Promise Pink, (PRODUCT) RED, Ice Blue, Jade Green and Passion Purple. Plus, you can now save lives when you buy a Mini (PRODUCT) REDTM , since a portion of the proceeds will go to The Global Fund to help eliminate AIDS in Africa. And with every purchase of a Promise Pink Mini 10 or Mini 10v, Dell will donate $5.00 to Susan G. Komen for the Cure® , the world's largest breast cancer organization. The Dell Inspiron Mini 10 and the Mini 10v were developed from the ground up to be the perfect companion, helping you stay connected* while on the go. Store your music, photos and more on the go. While the Inspiron Mini 10 and Mini 10v offer up multiple hard drive options and 2GB* of memory*, you can also keep your files online! We've partnered with Box.net* to provide 2GB of free Internet storage for every Inspiron Mini 10 and Mini 10v customer. Store, access, collaborate and share any type of file through a secure, simple and intuitive web browser experience. Plus, you can purchase larger accounts to store more files. The Mini 10 and Mini 10v’s keyboards are so easy to use. At 92% the size of a traditional laptop keyboard, your fingers will be pleased with the Mini 10 and Mini 10v’s keyboards. And with a multi-touch track pad, you’ll have an easy time navigating. Plus, it’s spill-resistant, in case an accident happens. No need to sacrifice weight for battery life. 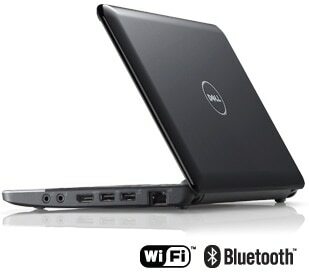 The Inspiron Mini 10 and Mini 10v provide extended battery life while keeping the weight of the systems under 3 pounds*. Take advantage of all the fun that the Mini 10 has to offer. The following features are available only on mini 10. HD capabilities – Enjoy your favorite movies on the optional 720p Hi-def 10.1" seamless display surface*. 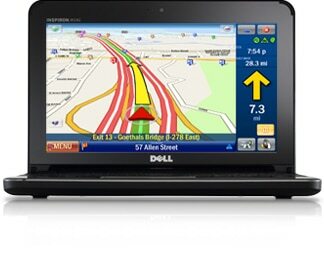 Navigation – Know your way like the back of your hand using the optional GPS with optional internal WWAN support. Design Studio – Personalize your Mini 10 with cool designs from artist Tristan Eaton in Dell’s Design Studio. The new TV – Watch your favorite TV shows with the internal digital TV tuner. Our online backup service offers data protection by enabling customers to backup data to a safe, remote storage site using a broadband connection. Dell DataSafe Online is easy, flexible and secure. Set up and forget it for backup of data and help protecting against software, hardware and catastrophic failure.